It’s over 10 years since I started out as a Google Ads agency with a simple mission: get the ads to work for businesses, not for Google. Google is a business at the end of the day, and they tend to give you a set of rules to follow that benefit them more than you; despite being in this industry since 2006, I’ve found that very few people actually know how to advertise successfully. The simplest and most effective approach to Google Ads is to deter poor quality traffic and focus on traffic that is most likely to convert. It sounds obvious; if you can achieve this, you can pay less for your conversions, whilst your competitors keep struggling with high volumes of clicks that don’t convert. What matters more: quality or quantity? It’s an age-old debate. In Google Ads, there is no debate behind this. 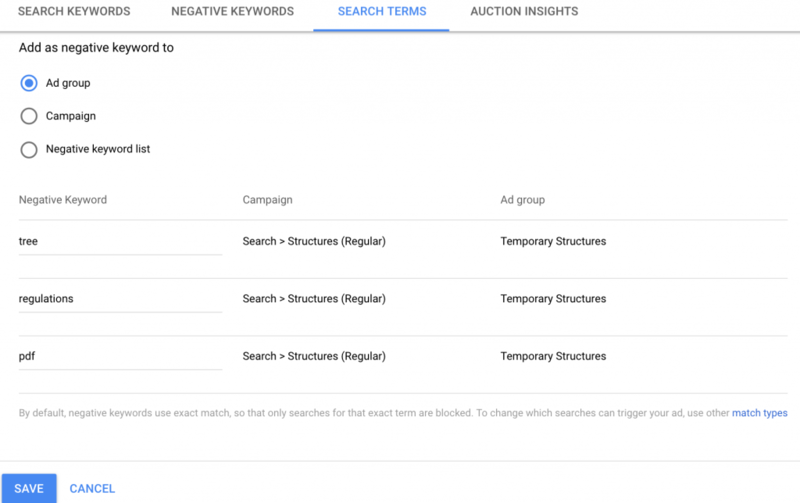 Introducing high levels of low quality traffic to your campaign is going to needlessly cost you money; you need to filter what people are searching for by introducing negative keywords. During my time working with Google Ads, I’ve found it alarming how many people still aren’t using negative keywords properly – if at all. Either way, there seems to be a huge misunderstanding around this incredibly vital ingredient to a good campaign. I’m here to break it down and show its true value in advertising, with a simple explanation and an easy-to-digest How To guide. 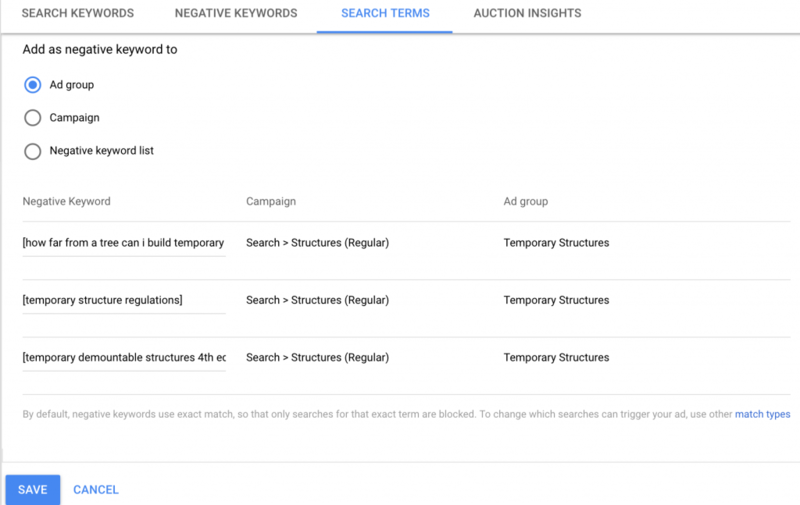 Why are Negative Keywords so Important? If you have a limited understanding of Google Ads, your ad copy is poor, or even if you have missing ad extensions – with clean search terms, you’ve got a 50% chance of your ads running successfully. By ‘clean’ terms, I’m referring to search terms that have a high probability of converting. For example, if you were selling shoes, you do not want search terms such as ‘free’, ‘images’ or ‘how to’. These are time wasters and will not convert into sales. 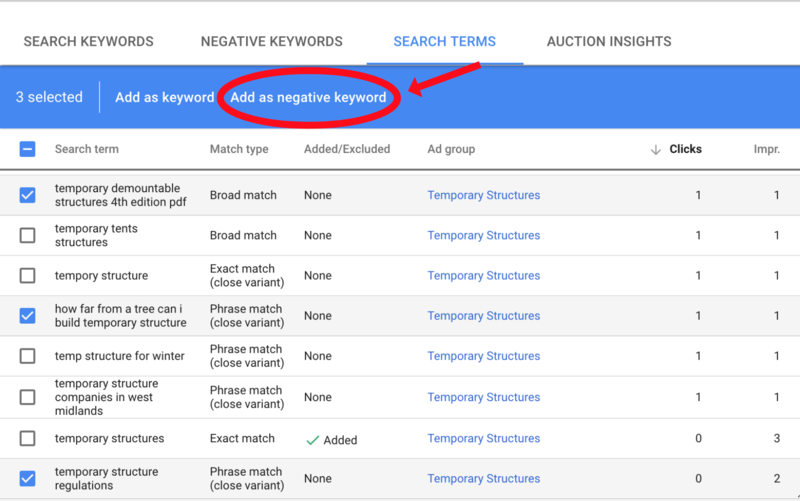 By using negative keywords, you are applying a filter to prevent your ads showing for search terms that will not convert or convert at too high a cost. Correctly filtering traffic on Search and Shopping ads enables you to focus on the best search terms. Let me put it this way: if you own a high-end designer shoe shop and you keep attracting people looking for walking boots and you don’t sell walking boots, they aren’t going to buy anything from you. By using negative keywords, you can effectively show your adverts to your target audience, making it perhaps the most important tool available to advertisers. Broad-Match Keyword: Any keywords in this search term will show when searched. In the case of a single keyword, when it has been negatived, that word will never show in searches going forward. For example, if you have negatived the keyword free, your ads will not be shown for anyone typing in the word free. Similarly, if a phrase has been negatived out, none of those keywords will show, no matter which order they’re typed in. If you negative out the words free contract, neither of those words will appear in any order, such as contract for free. Note: Broad negatives do not work like positive broad keywords: contract as a negative will not turn off contracts. Phrase-Match Keyword: This is more specific, and is identified with quotation marks surrounding the term. Once the term has been negatived out with quotation marks surrounding it, the advert will not appear when the keywords have been typed in that order. For example, the negative keyword phrase “free contract” prevents your advert being shown for someone typing that exact phrase. However, if someone types in “contract free”, your ad will still be triggered. Exact-Match Keyword: These are identified with square brackets surrounding the term. Your ad will only show when someone searches for your keyword or a close variant of it; for example, misspellings or plurals will still show. Search queries such as [free contract] would be prevented from showing, but free contracts could trigger your ads. Seeing as so many people get this wrong when, in fact, it’s very easy, I thought I’d put a quick guide together so you can start using it effectively right away. As you can see, some of these terms are relevant and some aren’t; you might also notice some spelling errors peppered about, but that’s nothing to worry about. Poor spelling doesn’t make for bad traffic. I’ve ticked the boxes of the terms that I want to negative out. My rationale for ticking these boxes is: the first is looking for a specific PDF, while the second and third are looking for general information. We want direct buyers, so I’ll exclude these kinds of terms from triggering my ads again. These terms will be added as negative keywords (see arrow in Fig. 1). After clicking ‘Add as negative keyword’, you’ll be brought to this page. This is the page where most people make their mistake. Often, users will come to this page and click ‘save’, thinking the search terms have been tidied; however, this only turns off this exact match (see: types of negative keywords above). Instead of turning off an exact match term, I’ve only turned off the broad terms that triggered the advert. Now, someone typing in the words “tree”, “regulations” or “pdf” won’t see these ads, and therefore won’t waste the advertiser’s money with a click. How Do I Know Which Terms to Turn Off? Brands – turn off any competitive brands you don’t sell. The last thing you want is to spend money on ads for people who are looking for something specifically. Advice – phrases like ‘how to’ can be a real kicker. Generally, these would fit in Broad Match queries, but they usually don’t want to buy what you have to sell. Be sure to stay vigilant of this. Discount – if you aren’t having a sale or simply aren’t cheap, don’t let people think you are. Know your market value and align yourself accordingly with keyword phrases. Google Ads is constantly evolving and adding new features to all elements of its interface. From its recent rebrand from AdWords to Google Ads, there’s a clear shift in its advancement. In the past, when checking accounts, you’ve had to manually turn off negative keywords individually while looking through huge lists of search terms. By filtering out the phrases to show only certain keywords, you can quickly turn off negatives in bulk. “If I have a particular product line (it works for brand terms too) such as ‘Hedgehog Ornaments’, I can filter the search terms to hide everything that contains the word ‘hedgehog’ and/or ‘ornaments’ – I know I won’t need to vet these as carefully. Please note that you need to be aware of misspelt search terms, as these often slip through the filters net. How Do I Use the New Filter Function? To use this new function, select the ‘filter’ icon, then ‘search terms’. Following this, you will then need to change the ‘contains’ option to ‘does not contain’ to give you the search terms that you are looking to review. Remember that, while it’s important to attract traffic to your site, you don’t want to be attracting the wrong kinds of traffic. The quality of the traffic is always more important than the quantity coming through. To speak to one of our advisers on how to propel your business to new heights, drop us a line on 01244 470067 or fill out the enquiry form below.